SKU: RCP 1868433. Categories: Backpack, Floor & Carpet Care, Vacuums. Choose comfort and clean with a lightweight backpack vacuum that’s designed with a comfortable harness and narrow profile for easy mobility. Sealed vacuum bags prevent dust and allergens from escaping back into the air. 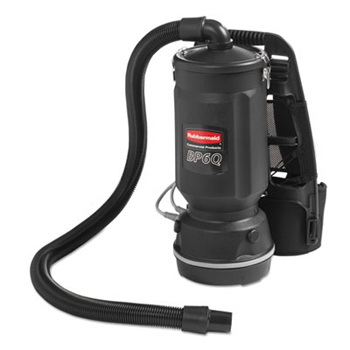 Quiet operation–at only 66 dBA, makes this backpack vacuum an ideal selection for noise sensitive environments where quiet is a priority. Provides a thorough clean with 100 CFM and 100″ water lift efficiency for clean carpets and hard surfaces. Swivel-head nozzle allows for easy maneuvering in tight spaces and around furniture. Hard-mounted cord restraint helps prevent cord damage and strain. Accessories come standard, including a flexible hose, crevice tool, floor tool, aluminum wands, dusting brush, upholstery tool, and cord. Includes one backpack vacuum cleaner.